Perfect your look with these outstanding and fashionable headphones which may become an ideal accessory. Twine is one of the three variations of headphones with innovative design that Molami, the Swedish company founded by industrial designer Maria von Euler, offers for music lovers that are willing to invest in cool sound equipment.Molami company is associated with luxury and technology because they offer unique listening experience through their products that are equipped with all the functionality you want while enjoy fashionable designs. If you like to have a non-classic over-the ear shape for your headphones, then the Twine style is the perfect choice. 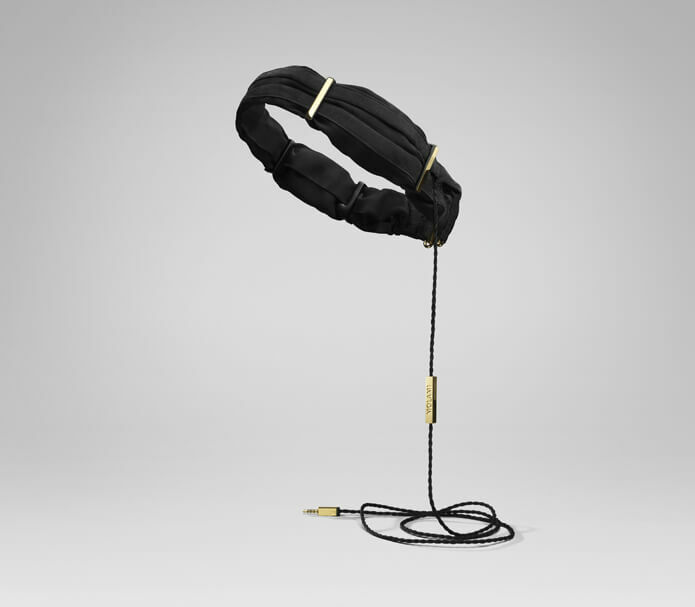 Made with exclusive fabrics and materials, silk-satin and chiffon blends, with some napa leather and stingray, Twine soft headphones comfortably wraps around your head as it wouldn’t be an electronic accessory but a modern headband, a really fashion statement. Featuring also metal accented bars that adjust the headphone placement, while a silver clasp holds everything in place at the nape of the neck, these headphones proves that comfort co-exists with fashion, a leitmotif of designer Maria Von Euler. Twine bring you into a world where high quality sound is guaranteed. A logo covered microphone and remote at braided, fabric wrapped cord allowing you to pick up calls and communicate while listening to your music and are compatible with most mobile phones featuring a 3.5mm plug. They come in two colors: black and white allowing you to add 18k gold accents or silver-colored accents. Additional size pads, right angle adapter, and fabric pouch included. It’s no doubt that Twine headphones demands to be noticed. Have fun!